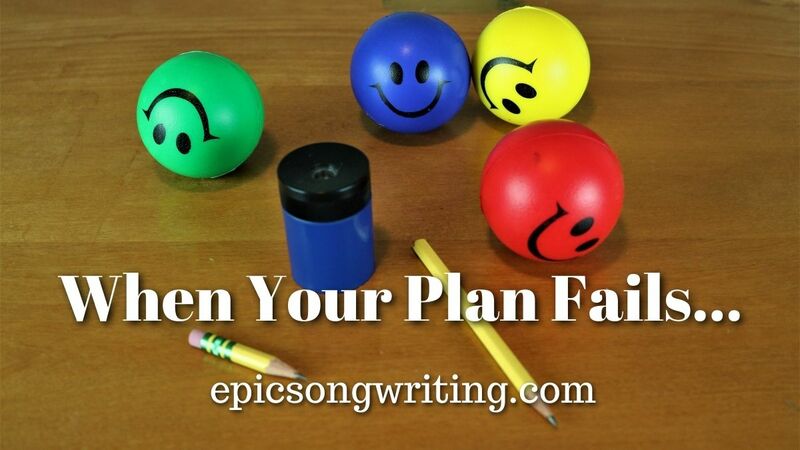 Songwriting requires taking control of your time, your emotions and your habits… and it takes planning. What do you do when your plan fails? The idea landed on me this morning. I was ready to shoot a batch of video lessons for module 2 of the Ultimate Songwriting Jumpstart. I stepped outside to enjoy a morning coffee in the summer sun on my deck and I heard a racket from the next street over. A work crew that’s been in the area for the past week replacing some broken sidewalk slabs was warming up their concrete saw at 7:50 AM. Okay, they can’t run it constantly all day… it will probably only ruin a few takes…. Before I was finished my coffee I heard a backup beeper from around front. A crew was unloading a dumpster on my neighbour’s front lawn… setting up to replace the roof today. So much for the video shoot, there’s no point trying to edit out the sounds of nail guns in the audio track. Happy Friday! When Have You Lost Control of the Situation? A song you wrote didn’t turn out as good as you thought it would be? A gig that didn’t go well, the audience wasn’t responsive or ignored you? A band member canceled on a rehearsal at the last minute with a lame excuse? An tuned guitar that went out of tune on stage? You woke up feeling ill, with a raw voice or even gone? Or Did You Make The Situation Worse? There are times when you can make it easier, but don’t. I can’t count how many times I’ve pushed too hard, skipped breaks and continued to work past the point of diminishing returns. I’ve made silly mistakes that wasted enormous time to fix. All because I refused to take a break when I was tired and needed one. Accept it… don’t waste time getting frustrated or angry. It won’t improve the situation and the only useful useful result will be practicing your irritation. Frustration, anger, getting defensive are all emotional responses to blocked expectations. You start a downwards emotional spiral…. Deal with it, don’t complain about it! Your situation and your present limitations are where you are right now. The songs you write are a snapshot of you as a songwriter and as a person right now. If you want to improve them, write more, instead of getting irritated at yourself. Identify where you need to develop yourself and take positive action. Remember the Tortoise and the Hare fable? Steady progress compounds over time to create huge results… lots of work once in a while leads to lots of frustration all of the time. Sorry to break it to you, but if you aren’t consistently putting in the effort, you aren’t going anywhere fast! I wrote the first draft of this article, shot the cover photo and edited three video scripts this morning… all before a scheduled afternoon road trip to get out of my music cave and do something different. Panda, aka “Mr. Friendly” needed to go out for a walk, of course he had to visit with all of the roofers and check if they had any extra sandwiches. I chatted with the foreman who will be doing an odd job for me tomorrow for a crazy good price and he also told me a story that will likely become a song. Sometimes you have to roll with it! The first plan is not the last plan. What’s Plan B, Plan C…? How else can you accomplish this goal? What other steps can you work on while you wait for other things to line up or problems to work out? Is that goal as realistic as you thought? Sure it sounded like an easy project…. Is your timeframe realistic? Just because you thought it would take a week, doesn’t make it happen that fast… most projects take 2-5 times longer than you expect. The goal might make sense, but is your plan workable? Do you even have a solid plan… or did you just imagine the end goal and think you could fake it to get there? Are there intermediate steps on the way to your goal? What additional skills you need to learn? Can you really do everything yourself, or do you need help? I’m terrible at asking for help. Here’s the short version of the story… I was struggling with new video editing software. There was an audible click every time I cut the video to a new shot and I couldn’t figure out what I was doing wrong. After checking the manual, the company website and YouTube, I finally contacted customer support. After exchanging several emails without a solution, they escalated my ticket to level two customer support. It took time but the problem turned out to be an undocumented incompatibility between the software and the video encoding of my Canon camera. To solve it, I was offered an upgrade to a more professional video editor. It was a problem I would never figure out on my own. Although the learning curve is steeper on the new software, I still came out ahead because I can now edit video in half the time and get a better final video. Ask for help! It can be a five minute break or longer… take it! The world won’t end and you will still finish the project. A five minute break can save an hour of redoing your substandard work caused by your fatigue. Last week, I skipped the day of writing and video editing that I’d planned and headed for the beach. I came back to work and got more accomplished over the next two days than most of the previous week…. Boring songwriters write boring songs… take a break from the music cave and be interesting! Schedule a regular day off… do something different! Most importantly… let the fun back in! What do you do when plan fails? 0 responses on "Plan Fails"